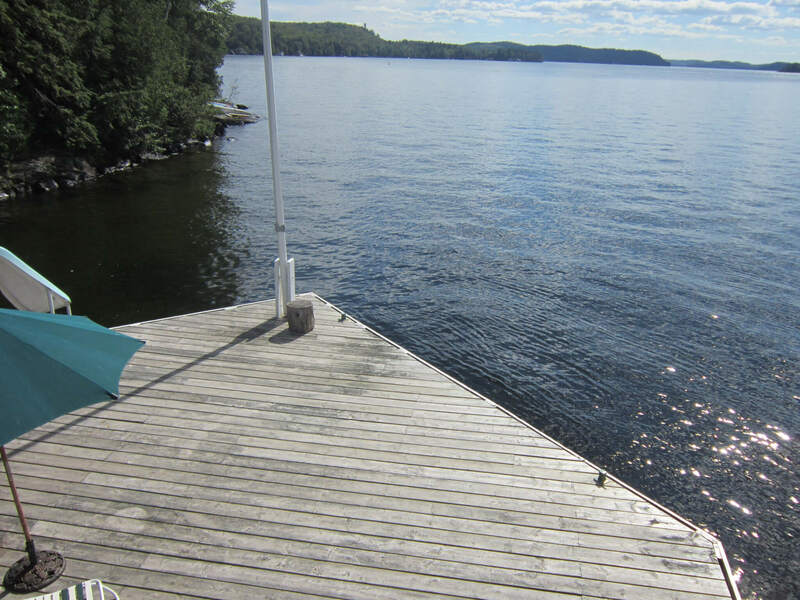 Are You Looking For The Ultimate Cottage Property For A Large Extended-Family Summer Vacation? Start a new family tradition this Summer! Prime 2019 Summer weeks available! True Olde Muskoka cottaging! 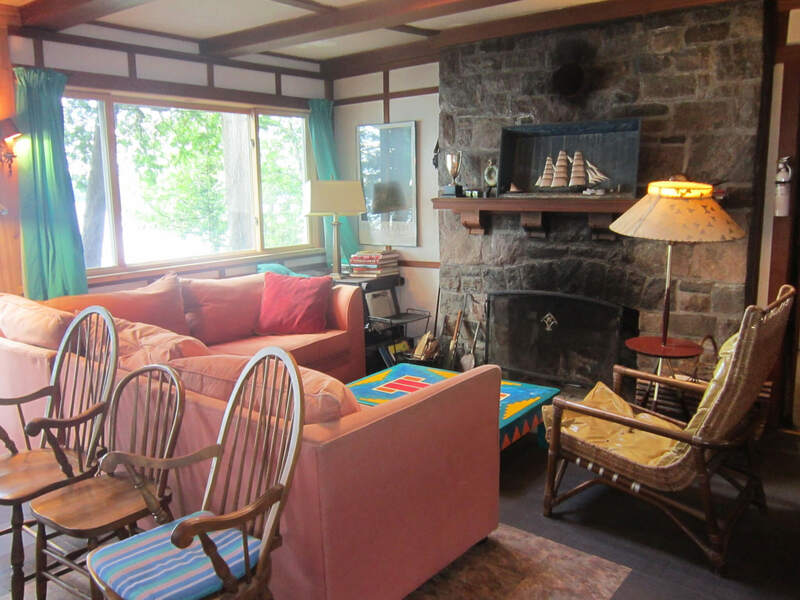 Come enjoy this exclusive heritage cottage on Lake of Bays. 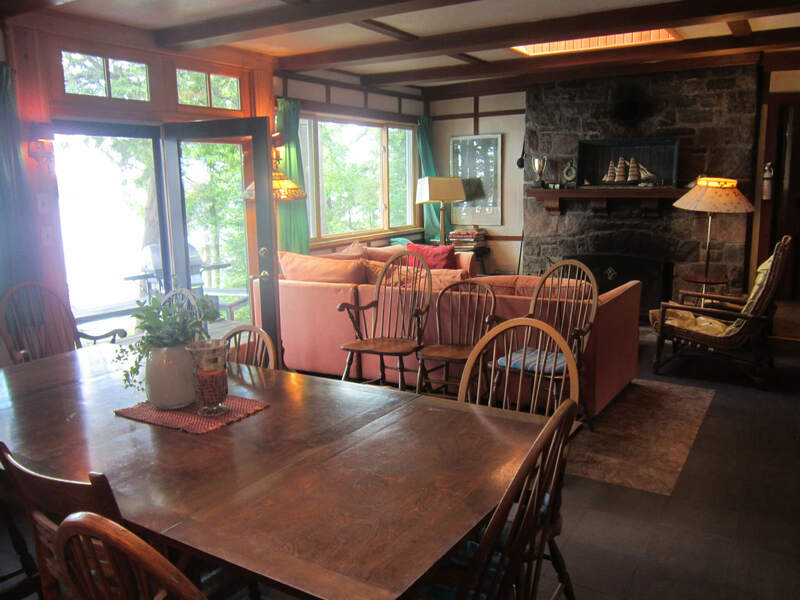 Built in the 1920’s, this classic Muskoka property includes a main cottage, loft and boathouse. 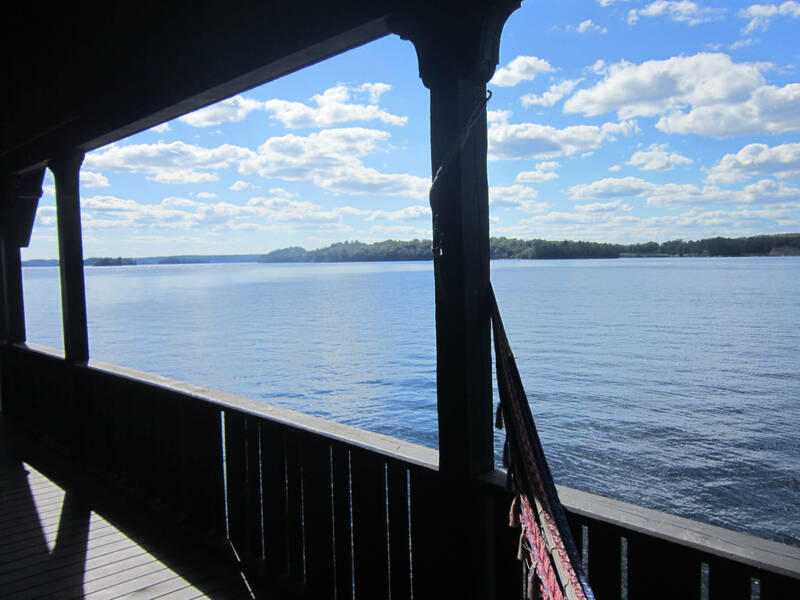 With 700 feet of lake frontage on a private point of land, The Scott Boathouse has some of the finest views that Muskoka has to offer! 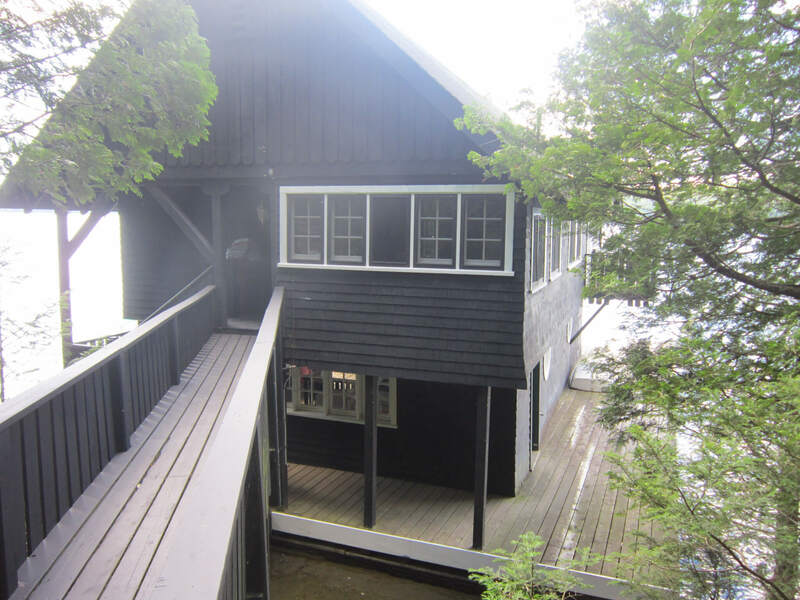 The Scott Boathouse is located between Bayville and Dorset, on Lake of Bays, only 2.5 hours from Toronto. There’s lots to do in nearby towns like Dorset (15 Minute Drive), Baysville (15 Minute Drive), Huntsville (40 Minute Drive) and Bracebridge (30 Minute Drive). 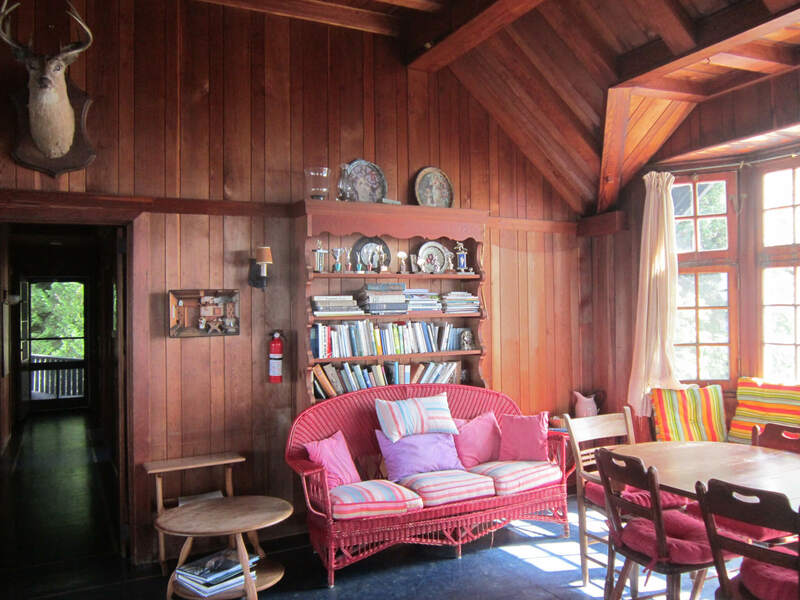 This cottage was built in 1924! Most construction took place during the winter, as the ice made it easier for the horses and sleighs to transport the imported Douglas Fir from British Columbia as well as the original wicker furniture from the roaring 1920’s. 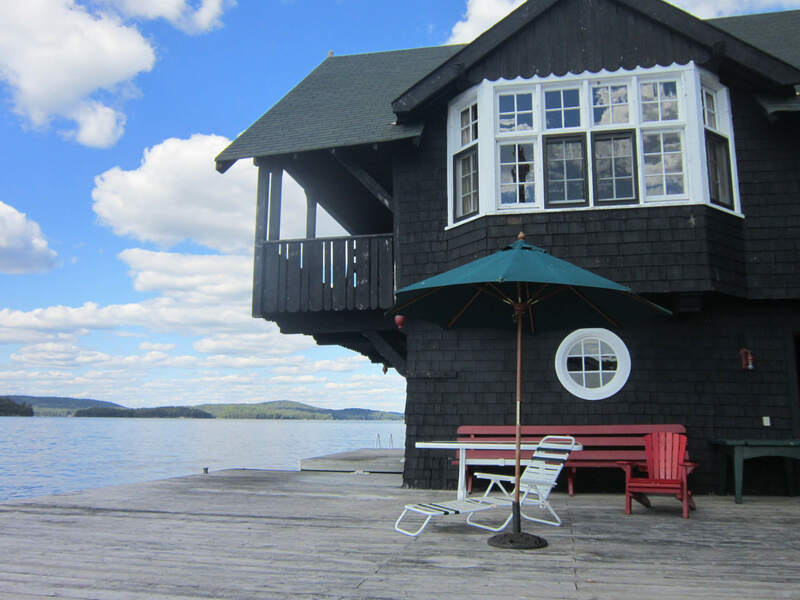 Luxurious for its time, this cottage has claw foot bath tubs, an outdoor shower on the dock, a flagstone fireplace, and even had one of the first underwater phone lines put in to call over across the lake to Bigwin Island. The Scott Boathouse sits directly across the lake from world renowned Bigwin Island and Golf Course, originally owned and protected by Ojibwa Chief Big Wind and holds the ancient burial sites of his family and ancestors. Bigwin Inn opened in 1920 and was an exclusive summer destination for tourists from Toronto and the US Eastern Seaboard. With 350 guest rooms, it was one of the biggest and most beautiful resorts in Muskoka at the time. Hosting and housing endless parties, dances and big bands. It is now a beautiful 18 hole golf course and country club and is known for wide fairways and sweeping landscape views. The 3000 foot unmanned/unmonitored concrete airstrip was built to allow wealthy cottagers from Toronto and the US to fly to the island at any time. The original ferry boat used in the early 1920’s can still be seen steaming across the lake from time to time. 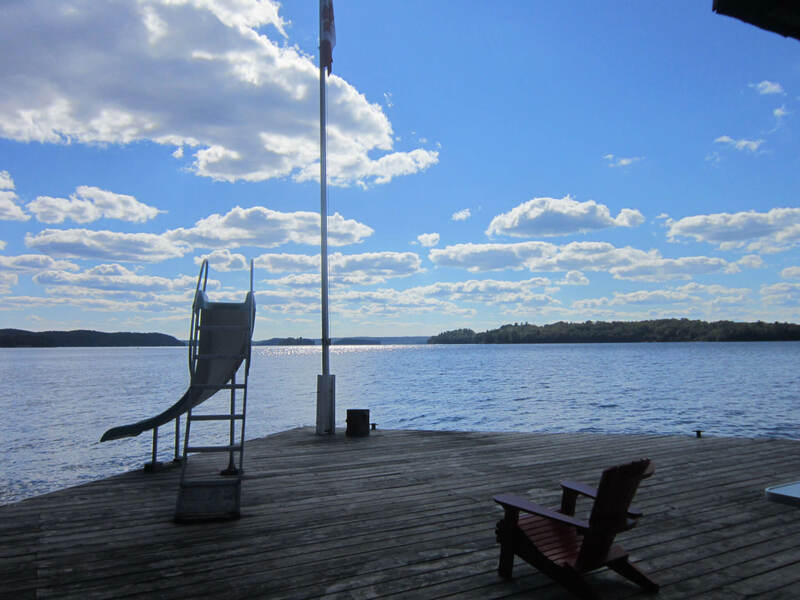 The cottage has been a part of the Scott family for over 70 years – we have been lucky enough to enjoy birthdays, long weekends, regattas, anniversaries, board games and all the endless laughter and beautiful sunsets for the past three generations. We’ve even had three family weddings on property, including live bands and dancing on the dock! We are excited to share this unforgettable place with your family! 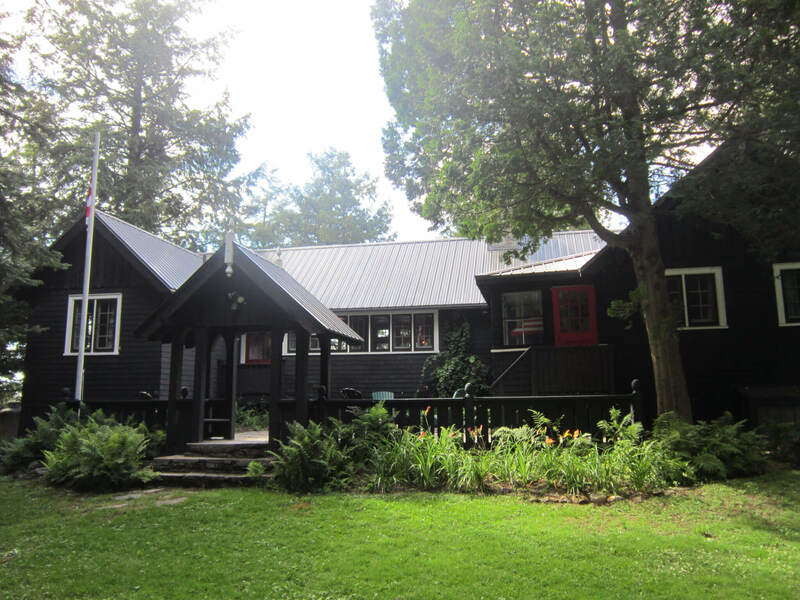 With 7 acres of untouched, pristine forest, this property is a beautiful family cottage compound, completely private and secluded, on its own point of land. There is a beautiful walking trail on the property that leads to a gazebo with a beautiful view of the bay. The long quiet stretches of paved back roads are perfect for running and cycling. All types of wildlife abound: ducks, dragonflies, deer, turtles, blue herons, song birds, woodpeckers, chipmunks, and maybe even a moose if you’re lucky! The large front lawn is perfect for activities like soccer, badminton, toad catching and tag. 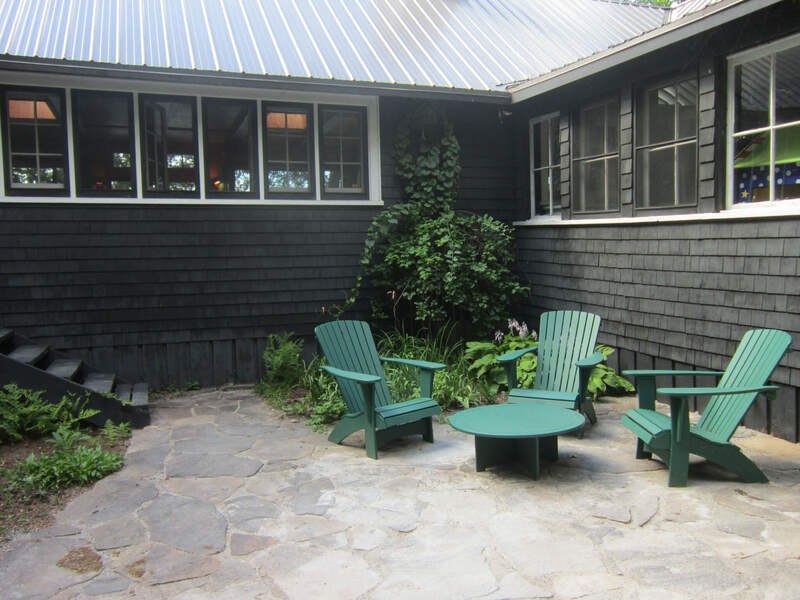 Dine al fresco or just sit back and relax in the spacious flagstone court yard surrounded by the smell of cedar trees and fresh flowers in the garden. With two propane barbecues, you can enjoy the perfect family cookout on the dock or the upper deck. There is enough parking for 8 vehicles and enough dock space to tie up several boats. 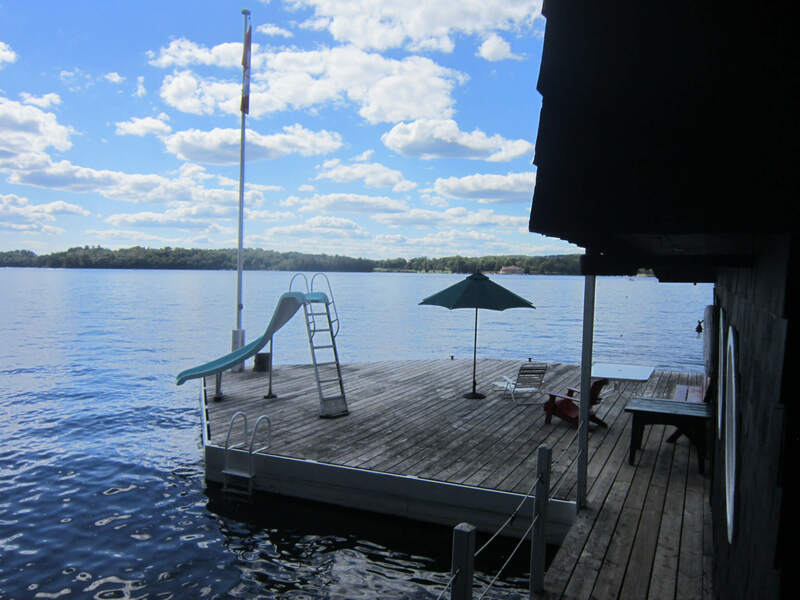 The Scott Boathouse is the perfect place for the entire family to unplug and create Muskoka summer memories! 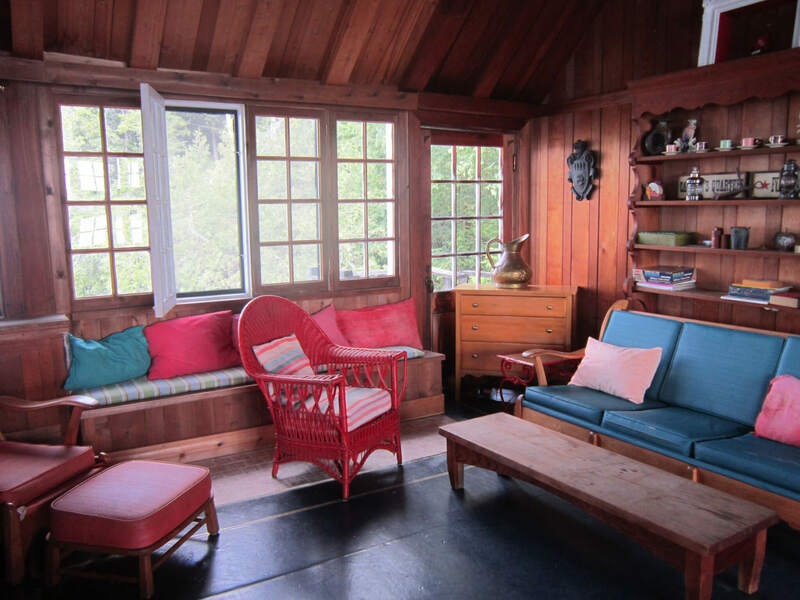 The main cottage living space is classic, rustic and Wonderful! Antiques and traditional cottage furniture are adorned with bright cushions and upholstery; wooden chairs worn smooth and golden with age. 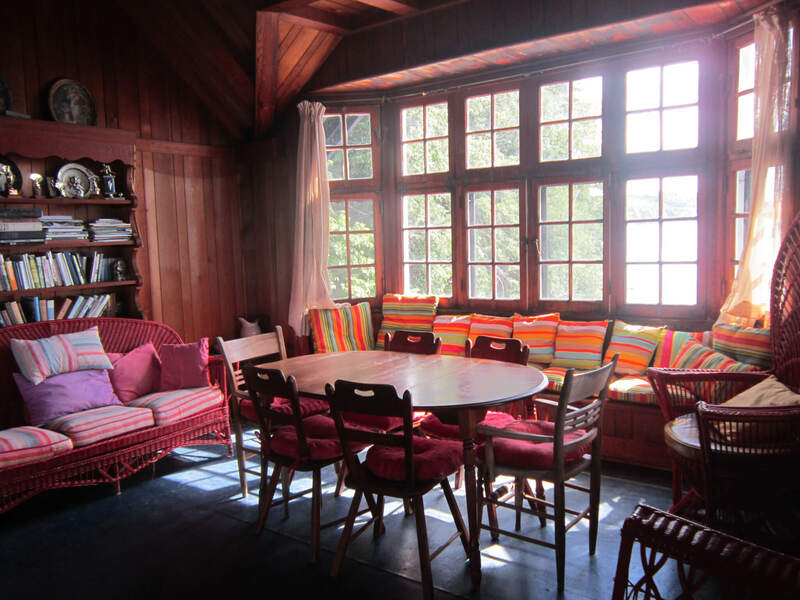 The bright warm dining area boasts an antique harvest table and row of windows with long views of the lake. 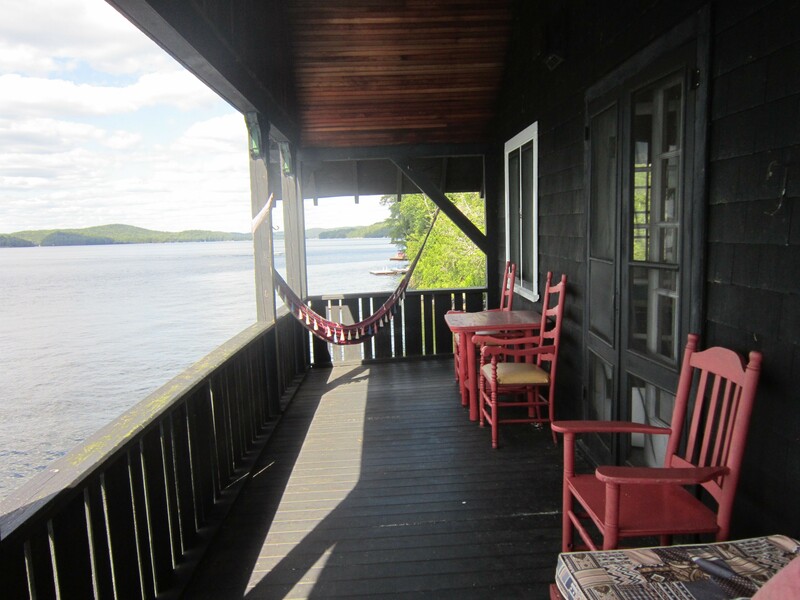 There is a walk out to the lakeside deck – a perfect spot for lunch overlooking the bay. Relax with a book or glass of wine in the Muskoka screen porch. 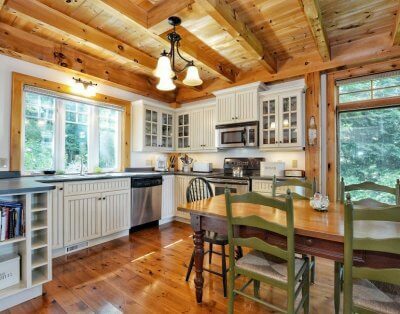 The original cottage kitchen features modern conveniences: refrigerators (2), stove/oven, microwave coffee machine, toaster. The children can enjoy their own private playroom full of books, games, puzzles, toys and even a puppet tent. 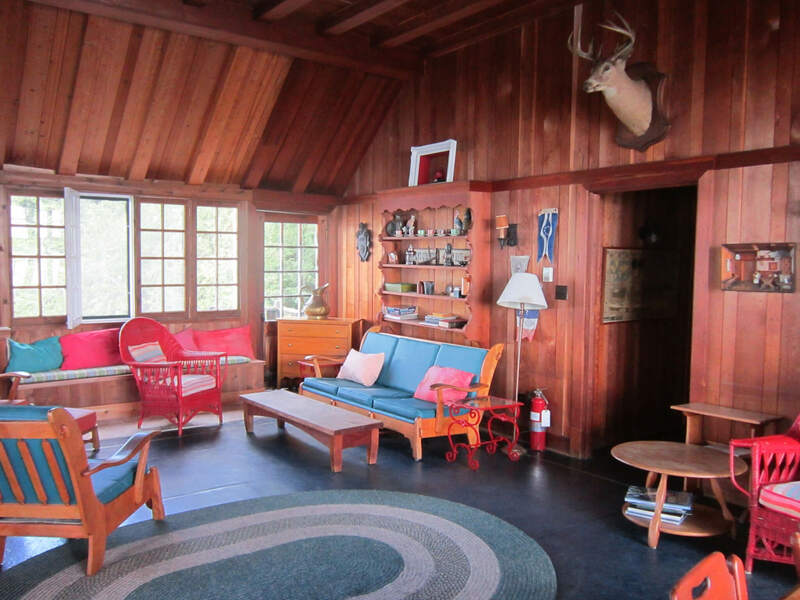 4 bedrooms and 2 bathrooms, in two different wings, round out the main cottage. 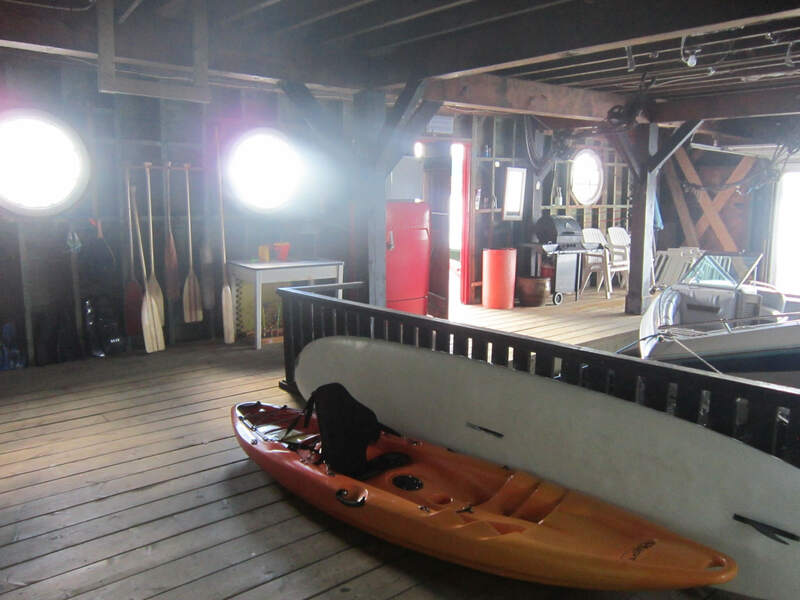 The boathouse boasts an exceptionally scenic balcony and an enormous dock. Originally designed by a sailor, the boathouse carries a fun nautical theme through and through. 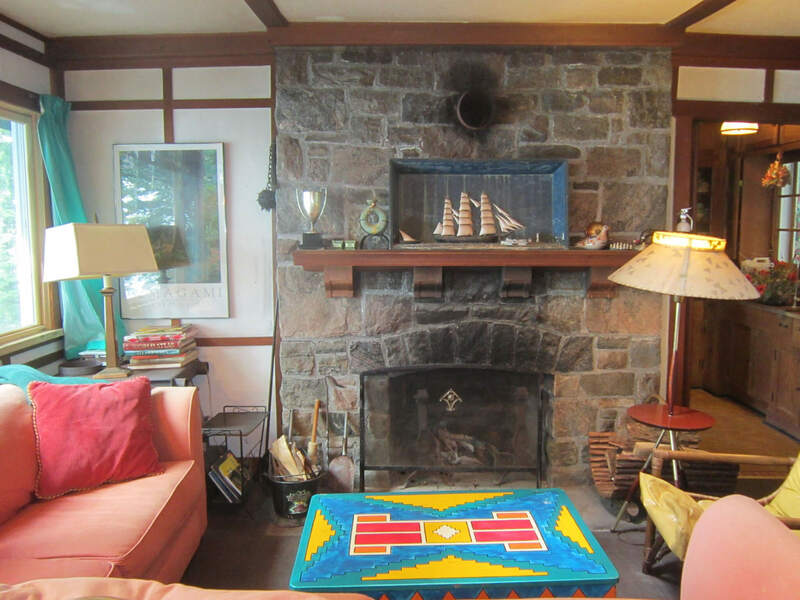 The door knockers and stops are anchors and boats, the bedrooms are quarters and the living room has a giant compass worked into the inlay of the original linoleum flooring. The dock is even shaped like the bow of a boat! The design and location of the building is truly unique and unlike any building you’ve ever seen before! The morning sun rises to start your day right with yoga on the dock or a refreshing swim in the lake smooth as glass. Fishing is incredible with many different species including bass, catfish, pike and perch. The sunny grand dock offers a great space for the family to lounge and enjoy the lake: swim, canoe, and kayak. Have a refreshing outdoor shower at the dock! Catch the magical sunsets while enjoying an evening cocktail. The starry nights are endless – find a shooting star if you’re lucky! On rainy days, you can watch breathtaking thunderstorms roll in across the lake. Tucked safely on the balcony, relax in the hammock with the peaceful sound of the rain. 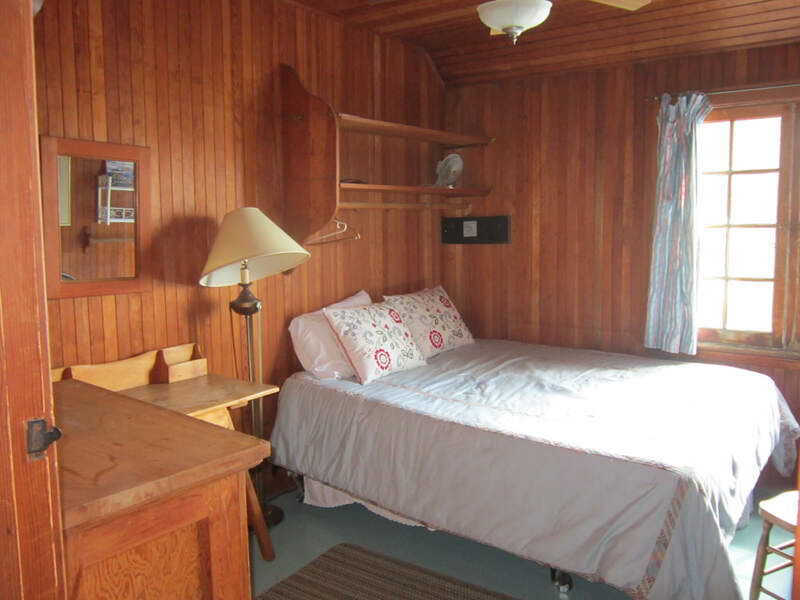 The boathouse features a convenient kitchen with refrigerator, stove/oven, microwave coffee machine, toaster, as well as a propane barbecue on the deck for grilling. 4 bedrooms, 1 bathroom round out the boathouse. Designed like a mini apartment, the loft is adjacent to the cottage and overlooks the front yard. It’s the perfect space for a family unit looking for a little privacy from the main cottage. Designed with an open concept, it features a queen bed and two singles for the kids, and its own bathroom. Bedroom 1: round king !